Nevertheless, to attract more audience, iOS developers should need to work hard to overcome different challenges. So let’s have a look at those challenges one by one. In iOS, it is surely easier to battle with compatibility, however, it is still a tough process for developers. It is difficult for developers to determine that which version of iOS will an application support? Several Apple products such as iPhone, iPads, etc. are accessible in the market for use. Thus it is important that every iOS application must be compatible with all the Apple products. Application compatibility is a challenge for instance, if new iOS version launched in the market, developers need to create an application in such way that it should support forward as well as backward compatibility. Another crucial challenge that occurs during iOS app development is managing the memory. Also, the performance of an application largely depends on how much memory does your device have. Well, iOS smartphones do not come with garbage collection function. Here, one can have the risk of the application being terminated, if it becomes a source control. Even if you decide to develop an application for a single version, do not forget that there are multiple devices with different memory capacities. Some popular iOS applications like games are of several Gigabytes in size and need a huge amount of memory. Thus, the app developers should consider these memory management problems wisely while developing the application. Well, along with memory, battery consumption is also one of the prime concerns while developing any kind of iOS application. You might think, a couple of generation-old iOS devices are most likely to relate to battery consumption problems. But sometimes new generation iPhones also consume a substantial amount of battery. And apps that consume more battery more likely to be deleted from user’s smartphones. Developers should carefully ensure whether an app is running well or not in the background. It should avoid the use of unnecessary processes that drain down the battery level. Nevertheless, network speed won’t be a big deal for every developer, it is a matter to pay close attention if your app involves streaming services like live streaming. So, in this case, you really have to put extra efforts to make your application more effective. Still, your app needs different network frequencies to perform different operations. For example, video sharing or streaming requires strong network connection than image sharing or chatting. Thus it is essential to test your iOS application under Network Link Conditioner. On-demand video provider company Netflix, for example, uses restrict video quality concept to help people adjust to the data demands. There are around 1.5 million applications in Apple’s App Store, so definitely you are not the first one to face such a problem through the approval process of App Store. If you want to understand the reasons for the app store refusal you would get numerous reasons on the Internet. Your app can be rejected just for a simple rule violation. And since the Apple’s policies change frequently, you should be familiar with all those latest terms and conditions defined by Apple for application submission on App Store. Be sure to go through and understand complete guidelines of App Store before beginning the task of iOS application development. Working along with the rules and regulations saves your time and helps you through different investment challenges. This issue usually props up mostly in the case of gaming applications. For example, you develop a game in the form of an app and then you get to know that your idea, style, mechanics, and other things are getting copied by somebody else especially if the game becomes popular. This sounds quite frustrating. Don’t get into this groove. Instead, keep on changing the tactics and adopt new techniques to remain ahead. 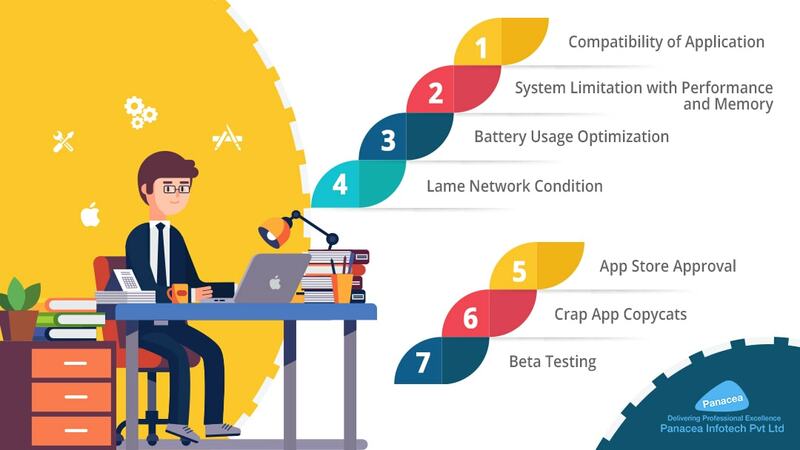 One of the optimal methods that you can implement for testing the app performance. You can test whether your app is functioning well and if there is any problem. It also helps in the removal of the bugs if any and this is how you can satisfy your audiences and get more of them. You can also say that it helps in-app promotion. If you are planning on becoming an iOS developer, it is necessary for you to stay abreast of the latest iOS mobile app development trends. You can join the with influencers in the field through Twitter or LinkedIn and contribute to the community by sharing your own learnings. Being on the cutting edge through reading, engagement and community is the easiest way to be prepared for any future challenges that pop up and avoid any nasty surprises.